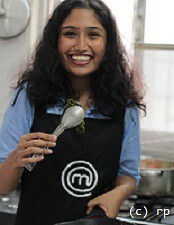 Riya Patel is the tiny, shy girl behind Yummy-Inside-My-Tummy – a blog for food enthusiasts, from Mumbai to Mantua. She was nominated for the category of Best Debut Blog and Best Restaurant Review Blog at the 2015 Indian Food Blogger Awards. At 20, she’s among the youngest food bloggers in town. Riya likes cooking, baking and dining out – not entirely in that order. She is a huge fan of Italian cuisine – loves her pastas and pizzas more than anything else in the world. She calls herself the ultimate Dessert Queen because of her weakness for anything soft and sugary. Currently a third-year Mass Media student at Sophia College for Women, Riya says that life in Mumbai has been a truly amazing journey, but Bangalore will always be home for her. Q – You’re so passionate about food and food writing – did you have any other career in mind? It now seems strange that not too long ago, I visualized doors opening for me at a lawyer’s office – I had seriously considered life in a black tux. But I guess my love for writing and describing food overtook my interest in the legal profession. And when the time came for the big move, I headed straight to Sophia’s in Mumbai for a degree in mass media. This was my calling – to take it to the next level and express my love for writing, and eventually writing about food. Q – This is interesting – where do you draw your inspiration from? I do not come from a family that has a food or hospitality background but both my mother and grandmother are great cooks. So from the age of 8, I’ve been immersed in pots, pans and the sweet aromas of cooking. I remember the first thing I tried out from this kids’ cookbook was “fish cakes” – a project completed with help from my dad’s mother. Later on, she helped me bake cupcakes and brownies for my school bake sale – she has so much patience with me. And always being around her and seeing how much she enjoys cooking has been very, very inspiring. Q – Do you have any famous chefs in your follow list? What do you admire in them? My follow list is awe-inspiring and includes names such as Heston Blumenthal, Jamie Oliver, Marco Pierre White and Nigella Lawson. These are masters of the craft and names that truly are up there. My idea of ending a hard day’s work is relaxing on my couch and watching their shows – and what they can do is like poetry in motion. Even though I’m still early in the curve, I guess I can chart my own path and destination – because I hope to explore the far corners of the world – in search of authentic cuisines that made way for modern interpretations. Q – Doing a food review and getting your hands greasy are on opposite sides of the table – where would you rather be? Doing food reviews at restaurants is one aspect of the kind of work I currently do, in addition to giving kitchen crews some very useful feedback – on aspects like taste, discernable flavors and how food can be served in an interesting way. I also like sampling food experiments at the kitchens of friends in my foodie circle who are serious about cooking. All of this can be tedious but it keeps me on my toes and helps me track the latest trends. At the end of the day, I love being in my own kitchen – this personal space is my biggest stress buster and has a calming effect on me. I feel like a whole new person in my kitchen and love getting my hands messy trying out new cooking styles. I also love being creative and experimental with flavors, and can come up with the most randomly creative dishes you could think of – my Fusilli-in-Curry is nice I must say, with generous toppings of potato crisps, herbs and cheese. Q –Did you ever think of food styling as a professional interest? Today’s career seeker in food styling has two avenues – food styling for photography, and food styling that ends up on your plate at a restaurant. It’s all about looking good. But I think I might explore the path of styling food that looks good on your plate. You’re working with real ingredients and not cosmetic sprays – you’re also working at making something truly appetizing. I am a perfectionist and for me, everything has to look good and taste great. That’s why food styling is a natural extension of my love for cooking – I also have an eye for detail and sprucing up. If the right doors open for me in food styling I wouldn’t mind taking it up as a career – it’s hard work, but there’s a creative element out here. Q – You’re aspiring to become a chef, food writer and critic? Where do you go from here? I graduate in a few months, and working for a year or two will be nice. I might also want to do my masters in journalism, along with a few certified culinary courses. I would have never imagined following this path before I came to Mumbai. This city has taught me a lot and given me wings. I now know what it means to be independent and forward-looking – with a focus on what’s on your plate. The one thing that never stops me from doing what I want to do in life is my heart and soul. So don’t be surprised when I send you an invite to the opening of my own little bistro – that’s another dream in the making. 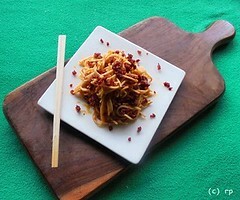 Riya’s Chorizo Noodles – A fusion of flavors with hakka noodles, smoked pork,red pepper and paprika – usually served with an authentic Mangalore curry and coconut milk.